Wendy's has updated its My Wendy's app for iOS devices with the ability to take mobile payments at most of its 5,800 locations in the United States, reports The Associated Press. The fast-food restaurant chain has reportedly been developing its mobile payment system over the past year, testing its app at some of its locations throughout the country. 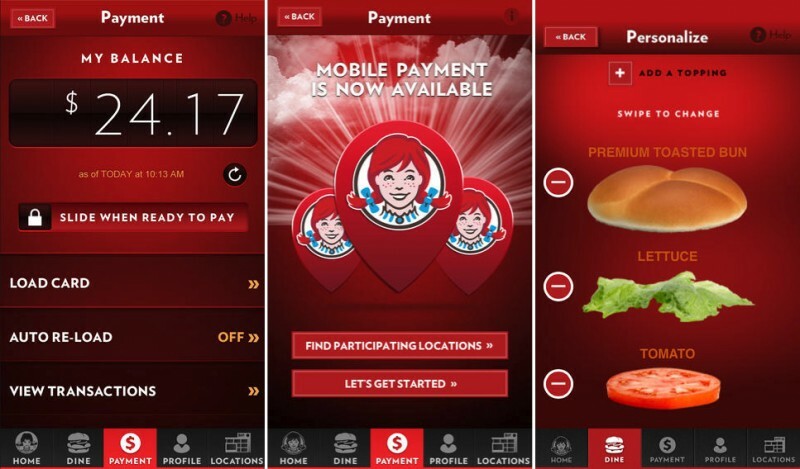 Once opened, the app allows users to find the nearest restaurants accepting the new mobile payment system, which can be enabled through the creation of a Wendy's profile. Unlike the process of mobile payments by other merchants however, a mobile payment at a Wendy's restaurant is processed by showing a cashier a generated six-digit number. According to Wendy's Digital Vice President Brandon Rhoten, this method was enabled to make it more convenient for customers going through pickup windows. The move reflects a push by fast-food chains to court younger customers by tapping into the attachment they have to their phones. The move comes as a number of other restaurants have begun to implement mobile payment systems, with Chipotle, Domino's Pizza, and Pizza Hut all adding support in their respective apps. Taco Bell announced last month that it would be rolling out its mobile ordering platform nationwide later this year, with Burger King expected to follow suit with its own platform. McDonalds, the world's largest fast food chain, is also expected to launch a mobile payment system sometime in future, with testing currently underway at some of its U.S. locations. Hey, all. Appreciate the interest in the app. On the "should have used iBeacons" or other tech front, we're testing many options including a digital offers system, ordering, and other technologies to allow people to connect with the restaurant. The reason we're not using Passbook is they do not support dynamically generated codes at this time. Bar codes aren't 1) secure enough and 2) require you to reach your expensive smartphone out of the window at a drive-through (not ideal, in our opinion). With 6500 locations world-wide there's a lot of trial-and-error we need to go through to figure out what works best for most. Happy to answer any questions about our app or why we're doing what we're doing. I seriously don't get it. How is this of any benefit whatsoever to me? I go to Wendy's, order my food, and swipe my credit card. The end. Why in hell do I need an app for every restaurant I patronize that basically serves as a prepaid gift card? How is this good or innovative in any way? I'm all for innovation, but I just don't see it here. Maybe I'm completely missing something, but I'm just not willing to basically buy prepaid gift cards in the form of mobile apps for every restaurant. This kind of innovation is great news for consumers and the kind you only get from iOS devices. Please, explain to me how this is innovation? It's a gift card in the form of an app, that's all it is. How is it innovative??? Haha. Don't actually say that, someone might actually do it. Yep, it needs to be funded from one source, I assume/hope that will eventually be your iTunes account balance. Retaining and managing small balances on a dozen different cards is a pain, and will stifle uptake. They had to find a way around Apple taking 30% of all in-app purchases. This is what Passbook was meant to solve, and I still don't see why it didn't catch on. The best way to do this would be to either have a unified payment system or find a way to round up all of the payment systems into one method (i.e. Passbook). We will also need some universal way to place orders so that I do not have to clutter my phone with apps for every food establishment that I visit. I think you are exaggerating the problem of multiple restaurant apps. Just put them all in one folder. Agreed, great push forward with mobile payments, but that doesn't make Apple the king of payment innovation. What about all those Bitcoin wallet apps they decided to ban?